I came across this card structure recently and have Googled trying to find the originator, but not having any luck. Since the card doesn't stand on it's own, I went a step further than what I saw and added a hole and loop for hanging - perfect for a Christmas tree. I really enjoyed making it and can see myself make a few more. 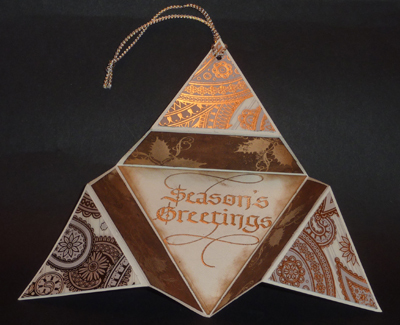 I'm also using a flourished holly design and the sentiment, both from Quietfire Design. To see more descriptions and details and the template etc, just click on either card image. Enjoy. Wow, this is soo Festive and clever! Such a Pretty Card! Very creative and so pretty too! How clever! You card looks fantastic and I love the idea to hang it up on the christmas tree. Thanks for playing along with us at creative stamp friends. What a beautiful card you have created. I love the cool folding technique that you used to create the shaped card and I love the shiny papers. Thanks for joining us on the Simon Says Stamp challenge blog. Wow, this is stunning!! So very unique!!! Thanks for joining us at Freshly Brewed Shaped Cards Challenge. love this, Yogi! I'll be making these for sure. Thanks for the detailed instructions! Fantastic shaped card. Thanks for playing at Whoopsi Daisy. 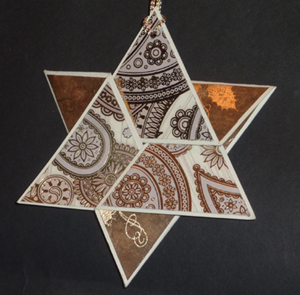 What a neat design, and great idea to turn it into an ornament! Thanks for joining us for Timeless Tuesday!